My life has been blessed with remarkable role models. And I was lucky to have experience with blended families and step-grandparenting early on. One of the most remarkable and inspiriting was my step-grandmother. She was my Tinker Bell, complete with fairy dust that made me want to follow in her footsteps. Ever since I was a young girl, I’ve been an intense observer of other peoples’ actions. One of these individuals, very early on, was my step-grandmother, who I called Aunt Clara. Why did 14 grandchildren call her by that name? Our grandfather insisted, out of respect for our deceased grandmother, who unfortunately, passed away before any of us were born! But Aunt Clara was a magical substitute, complete with all the right attributes to nurture us regardless of bloodlines. Her ability to make me feel special is why I felt like she had her own personal supply of fairy dust. As a young child, I remember saying, “Papa, I love Aunt Clara. Can’t I call her grandma?” The answer was a resounding, no. One day I secretly told her, “I love you, grandma” and she hugged me to her breast. Back then, little did I know that one day I would be widowed, then remarry and ultimately become a grandmother to a number of grandchildren that were not biologically mine. I wish my Aunt Clara were here today to observe my actions. She was my Tinker Bell, and set a high benchmark for me on how to be a step-grandmother. Thanks to her “training,” I like to think of myself as Tinker Bell with fairy dust for all of the grandchildren in our family—one big blended clan of biologicals and steps. From her, I learned the most important things in life about being a grandmother. And I’m sharing them here today. 1. Be Tolerant. Be aware that your adult children may resist your new spouse and his family. You can’t get pass “go” without establishing a relationship with the parents of the grandchildren. Remember, it isn’t easy for adult children to invite strangers into the fold. They miss their parent. But I know that feeling of “this is the real thing” will come when they see and feel a strong bond between you and your new spouse. The strength of your love and respect for one another will be of great help. Whatever time it takes … show tolerance to your adult children. Don’t be overly sensitive. Put yourself in their shoes. How would you feel seeing your mom married to a man other than your father? Not easy. Right? The relationship with your new grandchildren starts with their parents. 2. Be Attentive And Nurturing. You can develop a loving relationship with your new family of grandchildren (and remember…they are all yours!) by giving them your full attention. I email, text, call, listen to problems, laugh at stories and travel to seven states to visit my grands. My nurturing, a combo of affection, attention and telling them all “I love you,” shows them I care (and I truly do) and this builds a bond of love and trust. I don’t allow thousands of miles between us to play a role in our relationship because I keep in touch. Two of our grandchildren (my husband’s natural grandson and granddaughter) spent last year as exchange students in Israel and China. We were pen pals, writing weekly for a solid year. I tried with all my heart to establish a strong bond because I wanted to. This year one of our grandchildren, who had studied in Israel, is in China in grad school with the London School of Economics. He calls us almost weekly. He speaks to his grandfather for a little while and to me for almost an hour. We have bonded. He is not my biological grandson. It does not matter. He is mine. Period. So grandmas, it is up to us. 3. Be Wise. Your role is to make all of the blended grands feel special. Take your time to figure out what makes each one of them tick. Find their need. One of my grands likes one of my recipes without a certain ingredient. So I substitute something in its place, just for him, never mentioning what I have done but I know he knows and he knows I care. And always remember to put your grandchildren’s feelings before your feelings. 4. Build Trust. 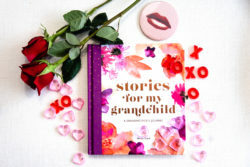 If you are a grandmother that had a step-grandmother you loved, tell your personal story. You will bond. Or share secrets, and never break your pledge to a grandchild. Tell them you know that once you tell a secret to one person it is no longer a secret, so she or he can count of you as a refuge from a possible storm to keep a secret. 5. Participate in their lives. Travel to their events. Share holidays and birthdays if you can. Take family trips. Blend! Blend! Blend! I must admit that none of my grands, unfortunately, have other grandmothers. I am their sole Tinker Bell with fairy dust. So I try to be all things to all of them. To you step-grandmothers who must compete with natural grandmothers I know this can make for real complications. Reality is part of life. If there are complications, I would try and keep harmony, at all costs. And I would make it a point to become close with the biological grandmothers! Of course, nothing is perfect, and not all of the grands of your spouse may take to you. But that doesn’t leave you off the hook. Find a reason to keep trying to make a relationship for the sake of the child. I am not a therapist! But I do know what makes me feel good, and it is being a grandmother to all my grands. I steer my course towards giving my love, time and thought. I feel joy when I think of each of the grands. They are not my husbands and they are not mine—I feel in my heart they are ours! And while I hope they feel the same way, I will never let any inkling that they don’t make me deviate from my Tinker Bell with fairy dust path.